The piece is signed by Goumain on the buffet as well as on the original sculptures, and dated to 1919. The Maison Goumain Frères was one of the businesses of Emile Guimet, a wealthy French industrialist at the end of the 19th century. He is most famous as the founder of the Musée Guimet in Paris in 1889, a museum of the history of oriental religions and folk traditions. A large part of the museum collections is from the excavations of Antinoë, a city in middle Egypt, carried out by the archaeologist Albert Gayet during 20 years of excavations beginning in 1895. 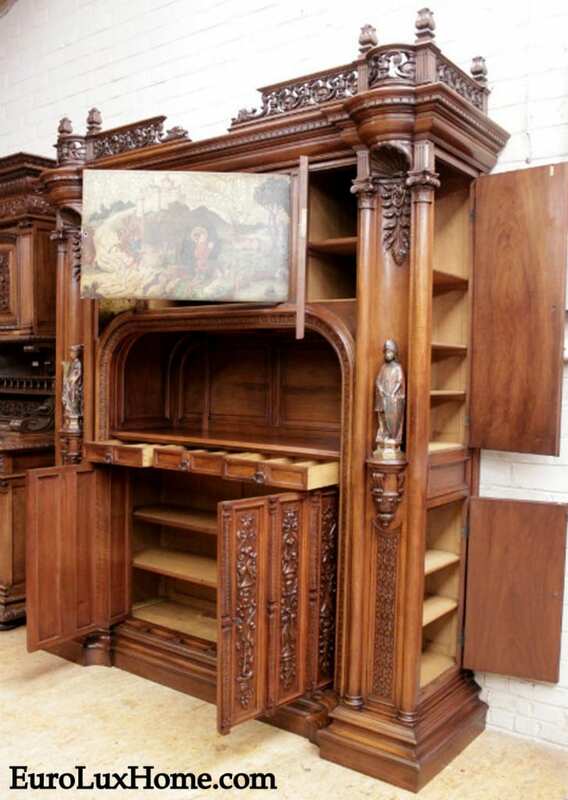 The Goumain Brothers specialized in furniture for museums as well as wealthy collectors. Pieces were designed to safely hold precious collections, often with many drawers, which protected the items from light. 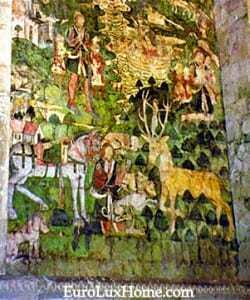 The painting shows the story of Saint Eustace, a Christian martyr and soldier saint from the 2nd century AD in Rome, Italy. A Roman general called Placidus was hunting in the woods one day when he encountered a large stag with a crucifix lodged in his antlers and he heard the voice of God commanding him to become a Christian. 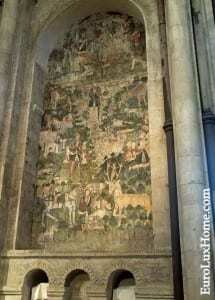 He immediately converted himself, his wife and his two sons to Christianity and took the name of Eustace. 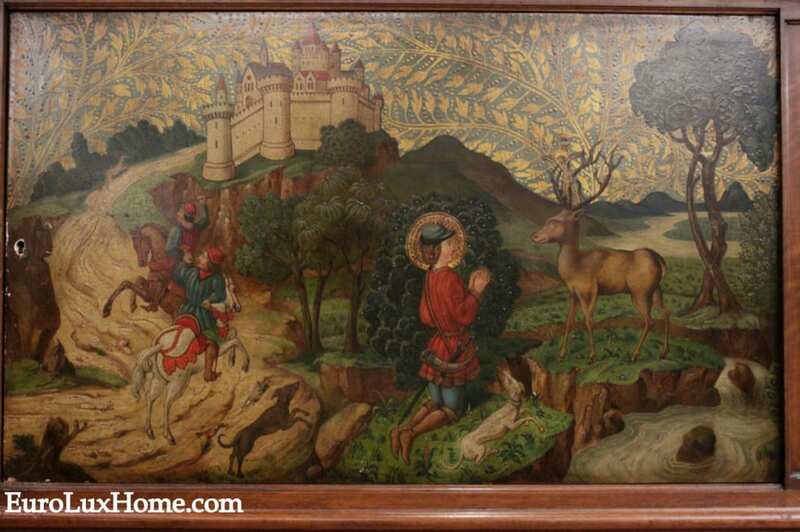 St. Eustace then suffered many trials and tribulations along the lines of Job from the Old Testament, including losing his home (the castle seen in the painting) and all of his wealth. He even thought he had lost his wife and sons for a period of time. Although he suffered, he remained constant in his faith and realized that God was testing him. Eventually he was reunited with his wife and sons, although the entire family was later martyred when they refused to worship the Roman Gods when commanded by Emperor Trajan. 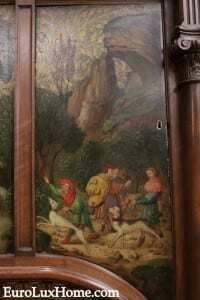 The image of Saint Eustace kneeling before a stag became a popular subject in medieval religious art. Saint Eustace is known as the patron saint of hunters, firefighters, and anyone facing adversity. An interesting tidbit is that Saint Eustace is the reference in the Jägermeister logo of a cross in between a stag’s horns, as the liquor was marketed as the drink of choice for German hunters. He is also the patron saint of Madrid, Spain. The saint is also featured in the stained glass windows in the Cathedral of Chartres. It is interesting to conjecture that this buffet was perhaps commissioned for a wealthy patron whose personal saint was Saint Eustace. The buffet not only held his personal material treasures, it served as a reminder that his true “wealth” was in the constancy of his own Christian faith. 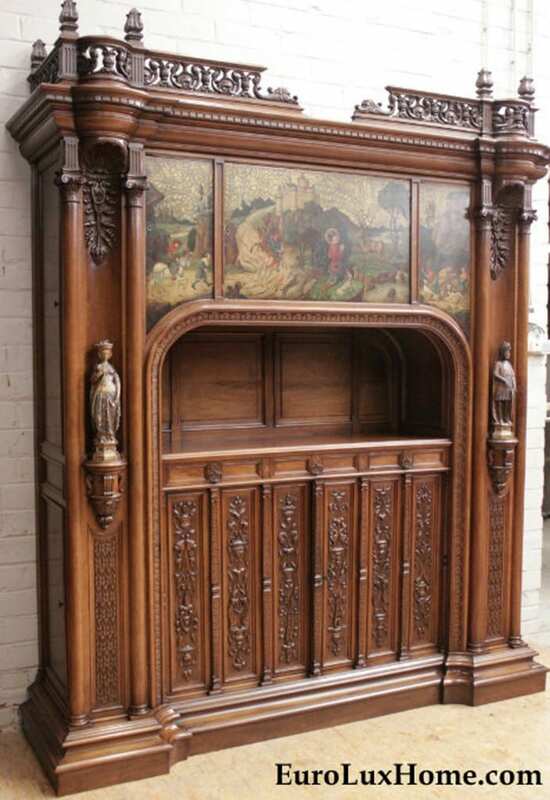 We loved finding this very rare antique French buffet by the Goumain Brothers. Now it has gone to a new home where I’m sure this rare treasure will be enjoyed every day! 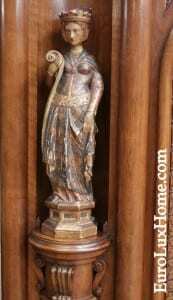 This entry was posted in Antique Furniture and tagged antique buffet, antique french buffet, antique French furniture, Antique Furniture, expert craftsmanship, Goumain, rare antique furniture on October 18, 2017 by admin.